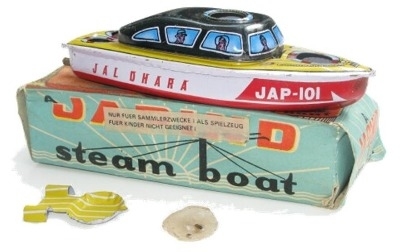 Japind "Jap 101" Steam Boat 1960's? Unused, Boxed, Complete with all Accessories. 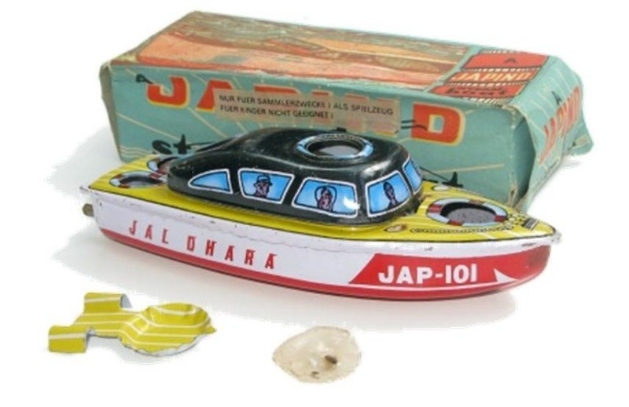 Side of the boat reads - "JAP 101 JAL DHARA"
This collectors boat features a removable top deck to allow access to place the burner under the boiler. Some age related marks and slight scuffing to the hull. Box is complete with all end flaps, but is worn and bent. Original yellow and white striped fuel holder.